Mild exercise for mild depression? The report’s authors showed "walking was an effective intervention for depression" and had an effect similar to other more vigorous forms of exercise. 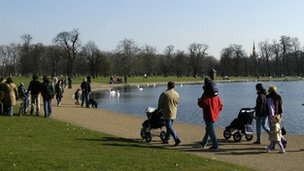 The mental-health charity Mind said its own research found that spending time outdoors helped people’s mental health. Its chief executive, Paul Farmer, said: "To get the most from outdoor activities it’s important to find a type of exercise you love and can stick at. Try different things, be it walking, cycling, gardening or even open-water swimming.